Improve your function on the fairway! West Omaha chiropractor, Dr. Dane Becker is a Certified Chiropractic Sports Physician (CCSP(R)). He is also a golfer who looks forward to playing a few rounds of golf when the beautiful summer weather is upon us. He’s always seeking out simple ways to boost his golf game and wanted to share a few tips that might help you when you’re out on the course. Arrive at the course at least 15 minutes early to do some warmups and drink water. Getting hydrated will prepare you for the game, and stretching can help ensure proper swing mechanics. Golfers tend to overlook what staying loose can do for them. You might be waiting for several minutes in between turns, during which time your body can tighten up and increase the chance of injury. You don’t have to wait until you’re out on the course to start boosting your golfing abilities. Regular chiropractic care can improve the range of motion from your neck all the way to your back and hips, giving you more power and control. 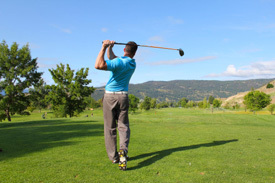 With regular chiropractic visits, your chances of injury are also lessened due to decreasing the discomfort felt during your golf swing, which gives you a chance at a better swing. Dr. Becker has seen numerous patients see an improvement in their game, from scratch golfers to once-a-year players. One person he saw was a weekly golfer who had been unable to play for two years due to low back and hip pain. He feared he’d never be able to golf again. After just a couple of treatments, he was able to play nine holes again. Knowing he could get even better, he continued his care and can now play all 18 without pain! Contact us to power up your swing, painlessly!